I created Daegen Burough for a play-by-post X-Men game. Daegen Burough is also known as Ampliphia, Ampi, or just Amp. She had a genetic predisposition for mutation that turned to full mutation through extreme physical and mental distress which left her with weak legs and left arm, poorer eyesight, and infertility though none of that can be seen by the naked eye. She amplifies others' mutations and can connect those with the same or at least similar mutations for further amplification. She has not yet found a limit to her range or limit to how many mutants she can amplify at one time. She needs to have at least a few moments of line of sight contact with the mutant before she can amplify the mutant's ability. When amplifying a mutation, she is mentally connected with the mutant, knowing all the mutant knows. What she does with the information is unknown. She will even connect two mutants on opposite sides for amplification. Her mind can not be read by any telepath nor can she receive telepathic messages, both give her headaches depending on the power of the telepath. A very strong telepath could put her into a coma. Because of her physical weakness, she will avoid hand-to-hand combat if she can. After meeting the mutants who she will be amplifying, she can usually work from home. Since she does not fight physically, she doesn't have or wear any armor or use weapons of any kind. Mutants usually classify themselves as homo superior. Since Daegen's mutation required an alteration to her DNA, she has been classified as homo subsuperior. Her mutation allows her to find those normals who are near miss mutants. She has not tried her amplification mutation on a near miss mutant, so she does not know if she could turn a near miss into a mutant. She is a fierce protector of normals, since she was one of them until her mutation emerged. When Daegen's mutation first surfaced, she noted that lack of support for homosexual and bisexual mutants. She founded the SupraRainbow Foundation (SRF) for LBG mutants. She has been absent from the SRF lately, but they have survived her absence. They have reached out the the normal LBG community and have been welcomed. Other than the SRF, she is not aligned with either side of the mutant war. 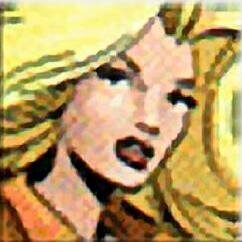 She will not use her abilities to assist in the killing of another mutant only the capture. Daegen has some post-high school education in business. When not working using her mutation, she is a homemaker who used to be in retail sales and debt collection. She was born in Maryland and is a citizen of the United States of America on Earth. She is bisexual in a long term relationship. She is Caucasian with dark blonde hair and blue gray eyes. She is 5'7" and 180 pounds. She dresses comfortably, though she does not like sweatsuits or sneakers. She has no criminal record. She has become a homebody and is developing sociophobia. She is quiet which makes her increasingly frustrated since she feels she can not voice her opinions without being censured. She will help whenever she can but requires she gets paid for it through donations to her partner for her upkeep. On any venture out of her comfort zone, she freezes up. She can usually be found surfing the net, reading, and role-playing. She had a somewhat normal childhood. Her partner knows of her mutation and does not care. He loves her too much. She drives used cars; currently a Dodge Caravan and formerly a Dodge Aries, Dodge Ram Charger, and a Geo Metro; in good condition. She only carries a cell phone to check in with her partner. The play-by-post game did not last very long. The moderator of it had real life issues creep up shortly after it started, so it did not get past introductions. TOAA's posts to me are included in the story only slightly edited. The invitations were sent out. He only hoped that they would come. He would offer them sanctuary and a new beginning. A safe haven, somewhere to call home. But they would need to come on their own. In return he would ask that they trust him and for their help. He learned that mutants were disappearing all over the world, even some of his own were gone. He had learned the the Genetic Research and Security Organization were out for mutants, Behind it's walls could only be the unthinkable. He wanted the disappearances stopped, he wanted the GRSO stopped. He needed new blood. People not known as his allies, mutants who flew under the radar. He sent out the call. He hoped someone would answer. She was watching TV, and her boyfriend was asleep beside her. She looked at the coffee table and saw the stack of mail. She flipped through the pile and sorted the junk mail from the bills. The newsprint ad that was sent from the local food store was folded over, so she opened it just in case another envelope was in there. She threw out a bill once that way. The envelope slipped out. She turned it over and saw that it was addressed to her. There was no return address on it. She tossed it on the junk mail pile. Her attention went back to the TV and listening to her boyfriend snore. When the show went off, she got up and got a refill of her iced tea. She picked up a book and started to read. Hours later she used the letter to mark her spot, but that is when something odd about the envelope caught her attention. She looked at it harder and noticed that there was a faint outline of an X on the paper inside. She opened it and then sighed. She read the letter. It was just too vague, she would need more than this to get her to travel. Plus, where was she going to get the money to do so. She will call them tomorrow and tell them no thanks. She was not about to get into the middle of the war with the mutants. She put the letter back in the envelope, envelope into book, book onto table, and body into bed. The next afternoon she rolled out of bed. Getting dressed in whatever was at hand, she went to the bathroom to brush her teeth and hair, wash up, etc. She got her wake up glass of iced tea and sat down at her computer. She opened her e-mail program and composed herself to type a note the Xavier. Due to the financial strain that such a trip would put on me, I can not join you at this time. Also, my other clients would find any visit to your school a proclamation of alliance, you should not expect me to visit. However, if this vague emergency you hinted at in your letter is of a universal threat to mutants everywhere, please let me know. She sent it out and went on web browsing. During her meanderings she thought about the invitation. Why in the world would Xavier want her anyway. She wasn't a true mutant. She thought back on the day when her "mutation" manifested. There was a traffic snarl, and she was caught in it. Suddenly from out of nowhere lights and beams and storms erupted around her car. She was trapped right in the middle of some mutant battle. Just as a weird plane passed over her car, something else was falling towards it. Then the crash reached her ears a mere millisecond before the roof of her car collapsed down. She was only able to avoid a terminal injury by acting quickly enough to get her seat down into a horizontal position. As it was, both her legs were broken as was her left arm. She wanted to pass out and believe this was all a really bad dream. Through a crack between the door panel, she saw someone walk over to her car, point at whatever was on the roof and try to lift it off without touching it. It must have been really heavy. Actually she knew it was since she felt the weight starting to crush her ribs. She stared at the person, and just wished that he was strong enough to lift whatever was crushing her. Then suddenly the weight was off of her chest, and she saw a look of surprise on the face of the man. And she also knew who he was and his entire life story. She thought she was hallucinating. Then she passed out, finally. Recovery was slow and painful. She didn't know how they were going to pay the bills for it. When her boyfriend said that they were being covered, she was surprised. That is when she got a visit from a mutant disguised as one of the nurses. There were tests of course, but since she was barely a mutant at the time, they left her alone. After shaking herself from her revere, she got to work on the bills and taxes, since they were due soon. There is a knock at your door. When she opened it there is no one there. Just an envelope on the floor. Through it she could see the out line of an X.
I am sorry that you feel the way that you do. I must confess that I am disappointed in your decision. I would like to express the importance of the situation that caused me to contact you in the first place. I implore you to come here and meet with me. If I am unable to convince you, you are of course free to go. Please give me the chance to sit and speak with you face to face. Enclosed you will find a check. There is enough to cover your expenses and transportation costs as well as your time. After reading the letter, she called her boyfriend. "Sweetie, I have a job and have to go. Talk to you when I get back." After several assurances she would be careful, "Love you Honey, got to go." She made a few calls to make travel arrangements. She showered and got dressed for the meeting. Her outfit was plain but nice and comfortable. She then drove to the bank to deposit the check and prayed that it would clear before the bills that she mailed the day before hit the bank. By the time she got back, the cab to take her to the airport was there. She got her bags and road away. On the plane she had to take an aisle seat, since she would need help to get up again. Her body had never fully recovered from the accident/attack. Every joint ached; every muscle tired easily. Even to get up to use the facilities was hard at times. On the plane she could not crawl if necessary. She also searched for other mutants on the plane. All she found were the near misses, those who would have been mutants had one gene gone another way. It would take a lot of distress or duress to bring out those mutants. She often wondered how many people realized that mutations were going to spread. How long would it take for there to be no normals left? With each generation the pool of non-mutants was shrinking, especially since the near misses would more than likely have mutant children. When the cab arrived at the academy, she got a helping hand from the driver. He looked at her quizzically, almost seeming to want to know something. "I take it you know a little more about this school than most people." When he nodded. "Don't worry, you'll be fine." She paid him, and he drove off. When she walked up to the school with her wheeled luggage, she leaned on the stone pillar that held the gate. The camera whirled around slowly, and then the gate opened. She walked slowly through the grounds and heard the sound of children playing. She smiled wistfully with a little bitterness. The incident that triggered her mutation and left her a near invalid, also left her unable to have children. She sat down on a bench and watched for a little while. She had a feeling that she might be holding people up inside but didn't feel up to moving just yet. "Excuse me kids, would one of you please tell Professor Xavier that Daegen Burough is here? Also, would you ask him to send someone to pick me up here or at least send a cart?" She didn't see anyone leaving right away, so one of them must be using a form of telepathy. "Professor Xavier would know you're here already. He will just read your mind." one of the kids said. "Sorry dear, but Xavier can't read my mind, and he has tried. All it gives me is one phenomenal headache. I can't receive telepathic messages either." She tried to amplify Xavier's ability to pierce her mental shield but the more she enhanced him, the bigger the headache. She decided to talk to the kids while she was waiting for either a message to say that they will wait or until transport the rest of the way would be provided. When it looked like no help to the estate house was forthcoming, she got up when her joints stopped aching and slowly walked to the mansion. She even enlisted the help of some of the kids with whom she was talking to take her bags to the house. Her hips, knees, and ankles hurt again by the time she reached the door. She walked in and took stock of who was here. 'Great, all guys, where are all the women?' she thought to herself. She motioned for the kids to just leave her bags by the door, then she ventured further into the room. "Greetings gentlemen. I'm Daegen Burough." She said simply without any false bravado or modesty. "So, what have I missed? And Xavier, couldn't you have had something waiting at the gate for me? You know how bad off I am at the moment." She then sat down on one of the sofas putting her aching legs up. As she looked around, she "touched" each person in the room. She knew what to latch onto now and how to make these men better with their unique skills.